The Toyota Yaris Hatchback has been announced! Expected to be introduced at an important event soon is the Toyota Yaris Hatchback. Indeed, the Japanese car manufacturer will be unveiling its latest vehicle which has been revamped. Choosing April’s Fools Day to tease about two new vehicles, Toyota unveiled the 2020 Yaris Hatchback. The car will make its debut at the New York Auto Show which is taking place on April 19-29, 2019. Inspired by the Mazda2 subcompact, the sedan-related auto has also been rebranded from a previous model. Equipped with 106-horsepower produced by a 1.5-liter four-cylinder engine, the Yaris Hatchback has a Sport mode which changes how the accelerator responds. The hatch which is featured on the Toyota sedan features several systems to help the driver. These include a Low-speed Pre-Collision Safety System, Traction Control and an Anti-lock Brake System. Similarly to its previous version, the upcoming subcompact features a 7-inch touchscreen and knob-controlled display. The automobile also comes with a six-speaker audio, Bluetooth, two USB ports and satellite radio capability. Furthermore, it is compatible with Apple CarPlay as well as AndroidAuto. 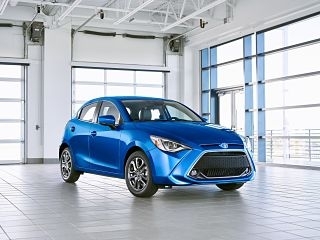 While the manufacturer did not confirm the price nor the release of the Yaris Hatchback, the auto is expected to be available on the market following its introduction at the New York Auto Show. The price is set to be higher than the 2019 model.